These are from various channels and vary in dates, most will be from around 2013/2014 though! Come check out the playlist here, if you find any other old videos let me know and i'll add them in! Have you been wanting to create video clips or even live stream? I found the perfect software to help you do that and it's super easy to use! Share your gaming, art and entertainment with the world. Multiple themes available to fit your environment. Once you've used it a few times you should be more than familiar, I currently use the older outdated version and this is how it looks. Rate the Username Above you. repacked cache to fix gwd and some other issues. fixed an issue when eating food in certain areas, where a cannon is not eligible for placement. Void update from 30% accuracy boost, to 45%. Elite void also gets a +2.5 damage boost. Applied the same 15% damage boost to Staff of the dead that kodai wands have. Added support for new Amethyst archery items. Added Fletching support for creation of new Amethyst Archery items. Added mining support for Amethyst, need to pack new maps and obtain object ID. Stile at the Falador cow farm can now be crossed. Loyalty Manager - When you play for consecutive hours, you will now be rewarded automatically! Updated woodcutting rewards, Birds Nests for woodcutting, potential for any nest to appear. Added Clue Bottles for Fishing rewards and a fishing casket with some other rewards. XP Bonus Multiplier for equipment has been implemented! Example: Prospector Outfit -> Mining, Lumberjack Outfit -> Woodcutting, Pyromancer -> Firemaking, Farmers Strawhat -> Farming. 10% bonus to hunting experience while wielding the magic butterfly net. You will now receive a 5% experience boost to Fishing while wearing Angler pieces. ^ the full set gives you an additional 5%, for a 30% total boost. You will now receive a 5% experience boost to Thieving while wearing Rogue pieces. You will now receive a 5% experience bonus to slayer while wearing any of the slayer helm (i). Boss Event handler has been Updated with a better expansion. Added Double Gold event handler for all NPCS when active. Set the event to hourly. Updated the last spellbook teleports page with Cities teleports, All alphabetical order. Added Demonic Ruins PK teleport. Fixed ::discord command to auto join from in-game. Changed the "collect" option on bank booths and chests to support the player owned shop. Added support for creating & using the Godswords (or). Fixed arrows @ Kraken lair, now spawn under you like zulrah would. Changed AGS Formula slightly to be more accurate. Updated Client for new tele interface and made the scroll region larger to handle all teleports. Added some new login messages for ranked players, such as Veteran, Youtuber, Support and Staff. Added Vespula raid boss for boss event, made it a flying npc. Added Muttadile raid boss for the boss event. Farmer's Strawhat exp boost for farming. also a farming reward, from farming. Added some items to the Pest Control store - Mystery boxes, Crystal Keys and Genie Lamps. Enabled ::fps command for all players to use. Godswords (or) Hard Clue Scroll reward. NEW Skin colours! Speak with the Makeover Mage to customise your look :) - Must update client! Made some changes to how Skotizo works to revive him as a boss, made him a random event boss! Reworked the Skotizo Teleport, Dark Totem is now required for such challenge. Added Xeric's Shrine altar so it restores prayer. Added Dark Totems drop to all catacombs npc drops. Added the rest of the Cat Pets. Added a Cat Crate to the Mystery Box as a reward. Changed the Client name to just PkOwnage. Fixed a weird bug with a certain item and the general store. Added Money pouch examine as a chatbox message, along with the dialogue. Changed Magic Accuracy Forumula slightly. Fixed NPC Thieving (Pickpocketing), ID's were incorrect some by a long shot haha. Populated Ardougne, with Hero's, Paladins, Knights of Ardougne and Guards. The Soul Abyss Teleport, now teleports you to the Soul Rune Altar rather than the Astrals. Added Xerician Robes, Dropped by lizard shaman and lizard man. Fixed donation Quantitys. always ensure you have inventory space when claiming! Twisted bow no longer logs you out if you attack Gargoyles, Kraken Whirlpools, Dagannoth Supreme or Rex. Adjusted all Runecrafting XP Rates. Updated some of the web page footers making the website slightly more fluent to navigate. Completely recoded back-end & Completely remastered CSS. More secure using password hashing. Design is now mobile friendly. Changed the membership total donation pricing for the automated rank selection. Fixed the Playtime reward breaking the bank. Fixed some items that don't have a noted item ID, which would be lost if you withdrew as note from bank. The Crier and musketeer hat tradeable as they should be. Corrected the 3rd age magic equipment defense requirement from level 65 to 30. Been looking into the store problem, as donations are currently not live since the update! Twisted bow no longer logs you out when you attack any of the Aviansies. Fixed an issue with ruby bolts(e) counting as two kills when finishing off an NPC with a bolt special. Removed coins from playtime reward. Changed pest control to restore stats and reset prayer etc. Fixed an incorrect ID in the Pest Control shop. Fixed all the reward messages with a space between the reward and the fullstop. Made the farming pet a little bit easier to obtain, as it's hard enough as it is. Fixed Boss pets being added to the bank when you log out etc, they were breaking your bank. Fixed a bunch more NPC Combat Definitions. Changed the Moss Giants in brimhaven and other areas to be lvl42. Cache Updates. Full #146 Mapdata. Added Clue Bottle's Item Definition. Documented the object teleports available that were unknown to me in walktoactions. Changed rarity of RCing Skill pets, since there is 1 per altar. Expanded the Kurask lair in Fremennik dungeon via the stairs. Nieve's Slayer cave now takes you to the correct place. Updated the Slayer Cave NPC Spawns. Added the tunnel shortcut within the Cave. Added Cave Kraken lair teleport. Located the Thermonuclear / Smoke Devils cave, added a teleport for it. Populated the Smoke Devils cave. Fixed Mastermeall command (admin) giving people 138 combat. Began a basic Infernal Cave system! Moved Corporeal Cave Teleport temporarily. Experience rates have been halved. The Twisted bow should now no longer log you out after attempting to use against other players. Each prospector piece has been dropped in price and are now 100 golden nuggets per. Removed the Poison Spider task - Was told it didn't work! -Corporeal Beast Cave, Black maps. Still usable, moved teleport nearer the cave temporarily. -Saradomin Godwars dungeon - Boulder for entry non existent. -Motherlode mine rocks are glitched, some face backwards into the wall on the 2nd floor. -agility ticket npc is no longer a pyramid block. Redone all npc definitions to ensure twisted bow is working and stats are correct. Lava scales dropped from Lava dragons can now be crushed with a pestle and mortar to create Lava shards. Finished all or nearly all NPC Definitions for the Inferno Minigame. Added the Exit object when you are within the Inferno Minigame. Added support for Sacrificing your firecape to enable you access to join the minigame. Added Sacrificing Infernal capes for a chance at the pet. Blocked the Inferno fire entrances from acting like doors. Added the doors to access inferno. Added banking support @ the new bank area in Mor Ul Rek. Spawned TzHaar-Ket-Keh @ inferno cave, NPC will be used to start the minigame. You can now open the worn equipment screen when having a Twisted bow equipped. Max hit formulas (melee only) now round the number down to the nearest single figure. Reworked loginthread, handling your connections hopefully a bit better than before. Zamorak, guthix and Saradomin robe top are now full body. Mor Ul Rek Gem & Ore Thieveing, with respective level requirements set. Lava Forge @ Mor Ul Rek bank should now be working. Removed Skotizo from the DZ Slayer Cave. Fixed Taverly dungeon ladder, in and out. Fixed Kalphite Queen's combat stats. Fixed some of the tzHaar npc's combat stats. Populated Mor Ul Rek with some of the tzhaar npcs. Inferno caves is now a multi arena. Fixed one of the inferno cave npc which didn't work as expected. Heavy Casket (19941) Stand/walk animations! Cave Horror Teleport & Spawns. Using Item on bank - unnote x amount of item instead of all. Fixed Item switching which seemed to be delayed or slower i.e for bridding etc. Fixed Teleporting at 30 wildy with certain items (glory, cwars ring etc..). Fixed Mithril seeds for Flower Poker Gambling. Better ::update command. (Had some issues with player saving). Fixed the Item price of Potato Cactus. Fixed Input Fields on the resizable client mode. Example- Drop Table interface, Account Bank Pins, etc. ^^ Silent client update, still using 7.5 and if you use the pkownage launcher it will update for you automatically! Store is actually fixed fully this time. Added Mithril Dragon ranged attack, fixed the max hits of its attacks. Super attack potion (2) decanting into a (3) with giving you empty vials fix. You can now purchase Toadflax & Snapdragon with agility tickets. Fixed some of the buttons for Agility Tickets. Began adding a Magma Blowpipe, a custom red magma Blowpipe. Skotizo Safe deaths instance. (you needed another dark totem to get your items back before). NPC hits accuracy forumla has been reworked and is a lot more accurate. Magic accuracy has been fixed meaning splashing happens a lot less often if you've got mid to high magic attack bonuses. Fixed the Fire Cape sacraficing for the infernal caves when it's completed. Sulphur vents can now be used for cooking food in the TzHaar/Mor-Ul-Rek area. Added a decent base for Barbarian Fishing. Still needs to apply str/agil xp on each catch. Added a teleport for Accessing barbarian fishing. Added Barbarian Rod to the Skilling shop. Fixed an Obstacle Pipe at the Barbarian Outpost Agility arena, so you can exit the arena now. Nerfed clue bottle rates a little bit when fishing, it gave you way too many. Fixed some Clue Scroll Locations to match osrs wiki. Fixed a typo with a Dragonfire message. Moved the Ardougne Farming telespot. Added the Barbarian Rod to the Ironman Misc store. Networking and behind the scenes/Under the hood changes. More secure logins, lots of incorrect logins disables you for a while. Automated Backup task (Daily account backups). Account file moved, so you don't have to remember your password every cache update. Mithril seeds now work accordingly, with pickup and more than 1 plantable. Flower Poker Gambling could be played. The Pet options for pickup should now be fixed for most pets. Noting items by using them on a bank booth will now let you enter an amount, great for ultimate ironman. When Dropping items on the ground they should now show up for other players after some time. Drops Sytem reworked to a better working system. You should now stay in the same pest control game you were playing, if you happened to die. You can now Close interfaces with the ESC Key. You can now Skip Chat Dialogues by using the spacebar to continue. You can now 'Tab to reply' Private Messaging players who aren't on your friends list. If you are AFK for longer than 15 minutes without typing or clicking you will be logged out. Added Mithril seeds to the General Store. You will now get double Slayer points on the weekend. All slayer helm varients will now give the damage boost when worn. You can no longer take pets into the Fight Pits, Fight Caves or Inferno Caves. Removed the wall at Donor Zone which wouldn't let you enter the outside to skill. Removed Mithril seeds from the general store temporarily, still need some minor adjustments. Removed coloured slayer helmets from the Slayer store. Changed some of the item prices in the slayer store. Added full handling of coloured slayer helmet creation, KBD drops kbd heads, KQ drops kq heads, abyssal's drop abyssal heads and Skotizo drops Dark Claws. If your normal slayer helm is imbued, you can use the specific drop to make the colour slayer helm (i) of choice. Chinchompas when throwing are now a multi hitting target. Autocasting when you run out of runes and keeps on maging, should now be fixed and stops you maging. Gemrocks will now allow you to mine multiple types of gem from the rocks. Added the Salve amulet effects/stats/boosts. Added Gem Rocks to the Donator's zone. Silent Client update will have fixed roofs for camelot roof top course. Added Multi Area for when you go to the Catacombs lair. Added Imps to Zamorak KC and added some IMP Spawns. Fixed an Easy Clue to use the proper Blue Wizard Hat rather that a hat of a different unobtainable item ID. Fixed a dupe with the blowpipe. Adjusted the premade sets, moved some sets around and renamed some things, Along with adding a new set Main NHer thanks to 'Desolation'. Blocked some items from being sold to shops. Fixed a bug with the Zuk boss from Inferno Caves. Released the base build of the Inferno Caves, It's nowhere near 100% but you've all been asking, so here's your challenge! The Environment doesn't work. Pillars, Ancient Glyph etc. Fixed the Item level Requirement for 3rd age cloak equipping. Cooking Gauntlets Random Reward for cooking food, Give bonus XP when worn. Fixed the Profile likes and dislikes counter for the leaderboard. Moved the Gem rocks at DZ to free up walking spaces to mining things. Added the Ammo Mould to the Crafting "Mould Store". Angler top is now a full body armour. Removed Mithril seeds from the shop temporarily. Disabled Mithril seeds until the noclipping/removal of flowers is fixed. Added an 'Experimental Anvil' to be used for the cannonball creation. You can find this at DZ, Entrana Skilling or Max Zone. Added a 1/8 chance of Toxic/regular staff of dead to not use any runes on casting a spell. Added the Amulet of the damned effects for barrows armour/stats/boosts. Added the Amulet of the Damned to the Barrows Points Store and Barrows reward table. Adjusted some of the Barrows Rewards slightly to improve drop rates a tiny amount. Increased the 5000 buy limit to 50,000. Added a raid counter for GWD Raids. Added the raid counter to player profiles. Added a total hours played counter. Fixed player profiler privacy toggle saving. Cleaned up the object spawns manager slightly, had some unused object spawns. Added the Edgeville Furnace to work as a furnace. Added the cannonball creation anvil to the Edgeville Furnace area. The Furnace building at edgeville was not walkable before, you can now enter the area. Added the 4 Pillars to the inferno minigame to hopefully enable an easier experience until the rest of the environment is finally completed. Added a Duo slayer system, including players that are ironman accounts to participate. Added a couple new 'PkOwnage Quick Links' to the client. Renamed the profiles leaderboard 'ratio'. Added a Description to the Omega Egg. Added Deposit all feature to the Looting bag. Added Vote Tickets to the client. Added Smithing XP for when smithing cannonballs. Moved the Vengeance timer countdown placement when in fullscreen mode. Updated the Client to version 7.7 and Cache version 6.7. Updated the Server's Item Definitions to be up to date with the #156 OSRS Data. Updated the Server's NPC Definitions to be up to date with the #156 OSRS Data. Added the 'RuneFest' Shield to the Achievements Store. Added the 'Expert Mining Gloves' with an XP boost to the Moterlode Mine Store. Added the Deranged Archaeologist, with a super rare drop along with slightly better drops than the Crazy Archaologist. Added the new Guardian Boots, Upgraded Bandos boots. You need a Black tourmaline core to create the Guardian Boots. Added the Rune Pouch to the Bounty Store for PK Points along with a couple other PKP store changes. Coloured the Rune Pouch text to distinguise it from other chat box text. Fixed Rune Pouch Saving Runes. Added the Rune Pouch Destroy dialogues. Buffed AGS Accuracy Slightly more. Fixed the Cooking Gauntlets going in inventory, you need to check underneath you now! Cache Updates - Version 6.9 for Preloading Sets. Client Updates - Version 7.8 for Preloading Sets. Added the long awaited pre-loading sets interface! This grabs the gear from your bank providing you have it, Set up your inventory how you want and upload it to your Profile! Changed the Equipment tab button to open the Pre-loading sets interface, you can still access pre-made sets from your quest tab. Added an Prayer Altar to the Max Cape Guild. Fixed the 'clear' button's clicking field on the preloading sets interface. Light tuxedo jacket is now full body. Renamed a teleport on the Skilling Interface. Added Agility and Strength XP for when catching fish with a Barbarian Rod. Ahrim's Staff is now One Handed, and provides a 5% magic boost. Imbued Heart should now give a 10% magic boost when you have the item in your Inventory. Bandos Godsword now requires only 50% to do a special attack. Fixed The Agility ticket Vendor, some NPC ID Changes were made last cache update. Added more barb assault npcs around the penance queen to make it more interesting, as it is a queen and she's now being defended! Added drops for said new barbarian assault npcs, penance fighter and penance ranger. Penance Queen cave is now a multicombat area. Added ancient wyvern shield character definitions. Adjusted npc combat definitions for Crawling Hands. Adjusted some other npc animations. Fixed the 'Crushing Hand' Superior Slayer monster Anims. Fixed a +1 Killcount message when superior slayer monsters are spawned in to fight. HCIM have now been allowed to participate in raids, if you die you will lose HCIM status. Forum Tweaks & Plugin updates. Decided to have a play around with some forum features and add some that I like, and hope you also like too! Shows Avatar on Threadlist and Forumlist ->Shows last poster's avatar on threadlist and forumlist and owners thread on threadlist. MentionMe -> Display @mentions with links. MyProfile -> Enhances MyBB's default users profiles with comments, friend system and last visitors. MyCode: [ spoilers ] -> Allows users to use a spoiler tag within forum threads! Portal ReadMore Button -> Adds a button to portal announcements to collapse long posts. ProStats -> Professional stats layout at the bottom of the portal/forum page. Also updated some Registration Options. Some of these are definitely still subject to changes, such as a different spoiler system perhaps. 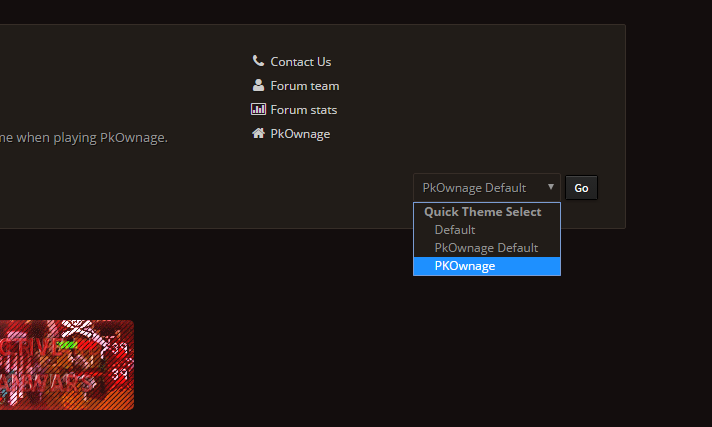 Other than that, more nice upgrades for our lovely forum theme courtesy of @"misharnet"
New Forums theme for PkOwnage! Just making a grand announcement on behalf of Yazoo. We have now got a new forum theme, super responsive giving the forums a fresh new feel and look. There is still a bit of work left to be done to complete the transition, but you're welcome to use it now! To change your forum theme please follow the following above, in the bottom right of your browser you will find the dropdown menu! We would appreciate any and all feedback on this whatever you like or even dislike. Our aim is to provide a new responsive, user friendly theme thanks to the designer Misharnet. Hey guys I wanna get to know you lot a bit better and what better way than to explore each other's hobbies? I'm a parkour traceur (practitioner) and of course I also program and play RuneScape/this server. I started programming around when I was 15 and got introduced by my cousin the world of RSPS and we played the Allstar servers and even made our own back in the day and it went from there, coding on and off since then. Whole point of this game is I choose the word what is related to runescape. Example GOBLIN, u have to choose the next word starting with word N, thats the last letter of my word. Thank you for coming to read the development log(s) of PkOwnage. First off I'd like to just say we appreciate all the feedback, suggestions and bug reports that we have received and they're being taken into account for. What this development log will consist of is ideas from us and the you, the community to help keep this server fresh with exciting new content for you all to enjoy. We also strive to diminish all existing issues that effect your day-to-day game play and we aim to improve that with your help on reporting said issues. - The Toxic Blowpipe now has a +60 strength increase to damage rather than the +40 it had originally. This is to make it more to how it is on OSRS. - Clue scroll drops have been added to the following skills: Fishing, Mining, Woodcutting and Thieving. - Minor text changes for when a player has recieved a skilling pet has been put in place. - The Giant mole has been moved to the centre of her lair. - The Giant mole should now dig more often. - The Giant mole is no longer an aggressive boss. - Reworked Dharok's set formula to simulate it more to how it is on OSRS. - General Graardor will now drop the correct amount of magic logs. - More text changes have been put in place for when a player recieves a pet. - When creating unfinished potions, the proccess has been sped up significantly. - All melee weapons have had their special attack accuracy buffed. - Shift-click drop is now in-game. Just hold down shift and click on the items you wish to drop. - Who ever does the most damage to an NPC, including Ironmen, will now receive the drop. - Admin icon now appears in the clan chat, chat. - Spaces have been added between icons and usernames in mulitple chat platforms. - You can no longer use other weapons in the Duel arena if Whip & Dds Only mode is ticked. - Cerberus now has a 1/20 chance of spawning ghosts to help assist him in the fight. - The PkOwnage bot has had a couple of answers updated. - A chat message will now appear instead of a dialogue box when creating super combat potions. - You'll no longer get a dialogue box appear after leveling up a skill but the message will still appear in your chat box. - Twisted bow no longer makes you invisible when firing dragon arrows. - The twisted bow will now do higher damage to NPC's with high magic attack that is above level 150, scaling to the NPC's magic attack level. - All trident variants have been sped up to meet the correct tick speed. - All crossbows (except Karil's) have been sped up by 1 tick. - Serpentine visage will now have a chance to poison your opponent. - You will now only be assigned between 1 and 5 Jad tasks. - Players will now receive boss points from Raids. - When a player has finished killing Zulrah, they'll now receive a message telling them their boss points. - Fixed Rock Cake killing you at 1hp. K'ril Tsutsaroth [zamorak boss] should be added into the boss slayer task list. Expanded camerazoom to 1250 from 900. Coloured Graceful sets to the marks of grace store. fixed a bug where you could tele at the back of the wilderness. - Slayer tasks have been reworked so you are now given less NPC's to kill. - Points awarded from Slayer have been reworked to be more balanced. - You'll now receive a message telling you how many points you've gained and how much many points you currently have along with how many tasks you have completed. - You will now receive a message on what skill level you have achieved. - The dragon harpoon will now be dropped from Raids. - You can now catch monkfish by using a small fishing net on the "Monkfish and Manta ray" fishing spot. - A couple more pet messages have been updated. - More NPC's will now be able to be attacked with the Twisted bow. - Raids rewards have been reworked. - You can no longer get rewarded from killing players on the same IP address as you. This is to combat the PKP farming issue. - You'll be shown the amount of PKP and kills you have when performing a successful kill. - You will now once again gain Slayer points from completing Slayer tasks. - adjusted ironman's damagemap counters. - Dharok's accuracy has been nerfed dramatically. - Special attacks will now hit more accurately. - NPC's should now take into account defence levels and bonuses. - Adjusted Venenatis slightly, hopefully for the better! Boss pet Skotos (Skotizo) - needs pet npc ID. Fixed tree stumps, added some more support for any missing cuttable trees. made mole skin / claws worth some GP. added cooked dark crabs so that Piles is able to note them for you. played with hunter implings again, messed some spawns up. fixed beckon/angry emotes, they were mixed up. Updated superior message and added colour to the message so it stands out. blocked weapon game from ironmans again. Added brutal black dragons and all catacomb npcs. Admins use ::anim ::cyclegfx, pnpc, staff2me, massbanner [message], resetmaster. Fixed Nunchakus to be 2h. Fixed Nature Ring turning you into a bush. Fixed x log at duel, account stays logged in until dead. Fixed respawn location to be set at duel arena. Halved the Pest Control waiting room time. Pest control now gives you twice the gold for completing the game, dependant on your Damage total! Updates the quest tab's Points Tracker. Change the thieving random text messages that appear. Thieving random is now slightly more common whilst thieving the stalls. Aviansies use ranged attacks as they should. Kebab's heal 15 hp-- uguthanki kebab can now be eaten and heal 19 HP. You can now eat Edible seaweed and Mushroom potato. Normal Combat Potions should now work and boost accordingly. Updated some Item prices and Alch prices for clue scrolls. Added some of the required Definitions to make the new Raid Bosses Fight - It's a start, we now have Muttadiles, Tekton, Vespine Soldiers and Vespula almost ready! Added Lizardmans, added medium task lizardman. Added Xeric Talisman & teleports. Fixed Cave Kraken, should now be attackable. Fixed Cave Krakens - 87 slayer to kill. Fixed Krakens - 87 slayer to kill. Fixed a duelling bug with ::master. Fixed an incorrect naming instance with Zandar. Fixed Mahogany, Teak and Achey Tree ID's. Changed wand to insignia in bounty shop. Changed the serpentine helmet(s) including magma and tanzanite to +3 str instead of +5. Edited void bonuses to be in line with the OSRS balancing tweaks they released. Removed Amulet of glory's broken charge draining system. Castle wars bank now works. Sorted the PVP Teleports to be in alphabet order. Pets should now have opposite options - picking & talk now talk > pickup. Leaving ffa Clan Wars restores your stats and spec. Tekton now hits a bit more through protect melee. Fixed the issue I made affecting weapongame, perhaps some others too. Added Potato Catcus to the herblore shops. Added GWD Wildy Dungeon accessible from the cave in 28 wilderness. Hopefully fixed an issue where teleporting out of clan wars broke your character controller settings. Corrected multi barrage to a 3x3 square. Added Tekton to the npc kill tracker. Redid Dragon thrownaxe spec, was hitting twice, might still not be perfected. Fixed a Agility shortcut at the lava maze -> 82 Agility requirement! Fixed the Lava Dragon Isle shortcut -> 74 Agility requirement! Fixed the wilderness Corporeal Beast Entrance, both ways. Added the Superior bosses to drop tracker. Mining Skill Expansion, Motherload Mine. Infernal Pickaxe now smelts normal mined ore for you randomly. Added some more Thieving stalls (Baker - Gem, in Ardougne). Rogue's wilderness chests can now be thieved. (the ones near chaos elemental). Hunter skill Expansion, with hunting chins and birds. Fixed an issue with the total votes counter. Fixed a premade gear items issue. Fixed Vetion hopefully should now drop items. Fixed Clan Chat issue with an interface appearing over it. Fixed an agility shortcut in taverly dungeon, also now requires 70 agility. Fixed the Shortcuts in the Catacombs Training teleport. Fixed Zamorak Godsword Special attack - Freezes the opponent! Fixed Crafting gems -> before Any item could be used on gems can chisel it. Fixed smithing giving you xp when refining ironbars, even when you failed to do so. Added a Global announcement when you get a jad pet from fight caves. Added Dark Bow Paints & Support for using them normally. Added some more 'valid Characters' for you password - Be safe, Be secure! *]&^%$"! Added the Occult Altar @ home for spellbook swapping. Added Ring of Wealth (i) support, now better than normal ROW. Added Monkey Child Pet to have two options for pickup. Adjusted the Clue Scroll Reward announcement prices. slight fixes with frozen whip textures, slightly better than before now. Staff members now get a login announcement. You can now use tridents with any magic book. Bank Booth Collect options now access the Player owned shops. Bank pins now remove interface for you upon entering successfully. Boss pets talking/animating! K'ril, kree, chaos ele, graardor and zilyana pet! pack 143 data to cache. -> still needs maps. infernal texture -> added it, needs more work though. Added all new items, item stats, equipment slots & Creation handles. Client version 7.1, Cache Version 5.9. Added more items to the Imbues store for NMZ. Added Overloads to be purchaseable for NMZ Usage only! Added Super Ranging & Super Magics also purchaseable for points for NMZ Usage only! Added a Secondary NMZ Store, with access to purchase items with your points. Added Tokkul Shop(s). -> runes, gems, all obsidian weapons. Added Ring of the Gods (i). Added Platinum tokens to the general store, with a price of 1000 each. Added Some of the new NPC's for Inferno etc, updating the lists. Also fixed some NPC Stand/Walk Animations. Added All npc definitions for new tzhaar npc's. Still to-do: Combat Scripts. Added The new tzhaar pet. Added Drops to tzhaar npc's. Added Melee formula's for Obsidian armour, combined with Obsidian Weapons. Added more of the Melee Formula for other obsidian weapons when worn with a zerker necklace. Tweaked some other Combat Formula's hopefully with nothing but improvements. Fixed the Wilderness coords, had a spot with no wildy that definitely should have been wildy. Fixed Elite void equipment requirements. Toktz-mej-tal is now 2 handed as it should be. Stopped pets going into the bank if you don't have enough inventory spaces to pick it up. Enabled Fight pits -> will be closely monitored. Cave Kraken's drop rate for tentacles. Players on your ignore list should no longer show up on yell. Super donor + and staff members can now use custom yell titles properly. Members now get a slightly slower prayer drainrate than a normal player. Added support for unpacking more armour set boxes. Added Extended Antifire to the consumubles shop. Added Regular & Super Energy to the Consumubles shop. Added some Commands for Supporter rank. Picking up Items that you already have a stack of in your inventory when it's full is now fixed. Fixed blue elegant skirt wield slot. Thrown items are now lost less when wearing avas cape. Hopefully some slight fixes to make the Entity Feed better. Cerberus is now a larger npc, complimenting Crystal & Dragon Halberds x2 Hit. Forgot Abyssal Bludgeon creating, that is now possible with all pieces. Re-Done Max Cape creation -> Other method was far too buggy. Adjusted AGS Special Strength bonus. Adjusted Granite Maul Special Strength Bonus. Updated mob Constants, Wyverns & Elvarg now count as Dragons. Corporeal Beast will no longer be killed by anything other than a spear, Zamorak Hasta or Ranged. Added Banks to Puro-Puro area. Realised Dragon scim (or) doesn't work as a noted weapon. Played with some formulas again to try get them more accurate. We are set on wanting to improve the raids system to a more advanced raids which includes bosses from OSRS and also the systems of farming and getting your own materials. This, of course will take a bit of time to do so but with your patience, I believe that it'll be possible in the not so far future. Another thing I'd like to address is the bossing system, which will be revamped I.E. boss reward points, items from rewards and general combat to and from the bosses making them more engaging. 04:54 AM 04-22-2019 Powered By MyBB, © 2002-2019 MyBB Group.